Jancis Robinson MW in the Financial Times: Has champagne lost its fizz? “For years, champagne ran the most sophisticated and effective public relations machine in the world of wine. Consumers were convinced that champagne and only champagne was the socially acceptable lubricant for celebrations and smart dinner parties. Jancis Robinson MW discusses the challenges internally and externally from other sparkling wine regions in the world and what affect it has on Champagne. 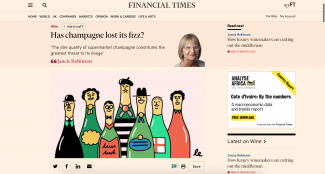 Writing for the Financial Times, Jancis explains the effects of post-brexit news and the upcoming rise of the ‘elephant in the room’ English sparkling wines. Read the full article in The Financial Times.